German Chancellor Angela Merkel and Russia's President Vladimir Putin will have plenty to talk about when they meet Saturday — thanks in no small part to U.S. President Donald Trump, whose sanctions and criticisms over trade, energy and NATO have created new worries for both leaders. Stefan Meister, a Russia expert at the German Council on Foreign Relations, said that there is "an increased interest on both sides to talk about topics of common interest" and that, in part because of Trump, the two sides have shifted focus from earlier meetings that focused on Russia's conflict with Ukraine. 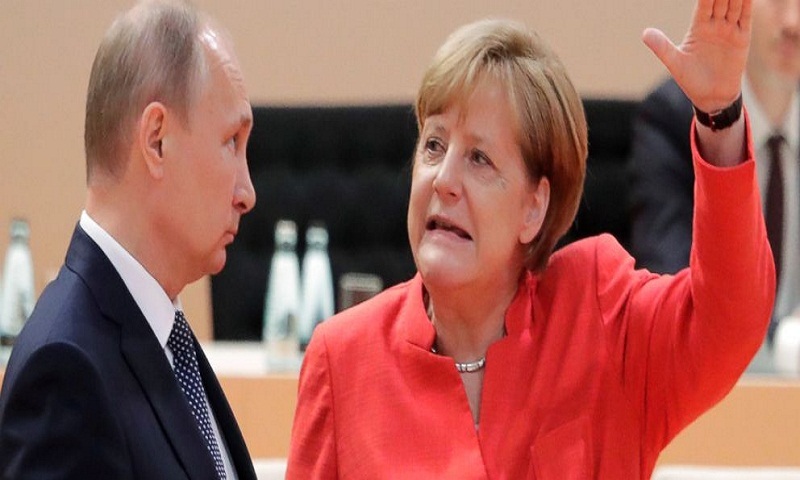 Merkel was a leading supporter of sanctions against Russia over its annexation of Ukraine's Crimea region. The background to this meeting includes Trump's announcement that he plans to impose sanctions on Russia in response to the poisoning of former Russian agent Sergei Skripal and his daughter Yulia in Britain. A first set of sanctions would target U.S. exports of goods with potential military use starting Aug. 22, while a second set of broader sanctions could take effect 90 days later if Russia does not confirm it is no longer using chemical weapons and allow on-site inspections. Russia has denied involvement in the poisoning. Meister said that Putin can use the meeting to "send a signal to Washington that there are allies of the U.S. that still do business with Russia." Beyond that, he can push for Germany and the European Union not to support further sanctions, particularly a second round that might hit businesses working with the Nord Stream 2 project. The project would add another natural gas pipeline under the Baltic Sea, allowing more Russian gas to bypass Ukraine and Poland. Trump has criticized Nord Stream 2 and the gas supplies, saying German is "totally controlled" by Russia by being dependent on the energy. Trump's criticism was linked to his push for other NATO member countries, particularly Germany, to pay a bigger share of the cost of NATO's common defense. Germany also has a strong interest in seeing some of the Syrian refugees in Germany return home in any settlement of the civil war in their home country, and could seek Russia's support for that with President Bashar Assad. Russia has backed Assad with military force. Putin has pushed Germany and other Western nations to help rebuild Syria's economy ravaged by more than seven years of civil war, arguing that it would help encourage refugees from Syria to return home, easing the pressure on Europe. Both Germany and Russia have expressed a desire to maintain the agreement with Iran to limit its nuclear program in return for easing some economic sanctions. Trump has pulled the U.S. out of the program and imposed new sanctions, saying that they will also hit foreign countries that keep doing business with Iran. Merkel and Putin have met and spoken by phone numerous times since she became chancellor in 2005. They share some common background. Merkel grew up under communism in East Germany, as Putin did in the Soviet Union; she speaks Russian and he speaks German after living in East Germany as a KGB agent during the Soviet era. That said, the relationship is characterized by hard bargaining over each side's national interest.